Though not as in your face as its older brother, it’s still too oaky for me. It’ll be the bees knees for anyone who prefers a rum with a drier mouthfeel, less sugar and more tannins in their rums than I do. This one’s all about opinion. 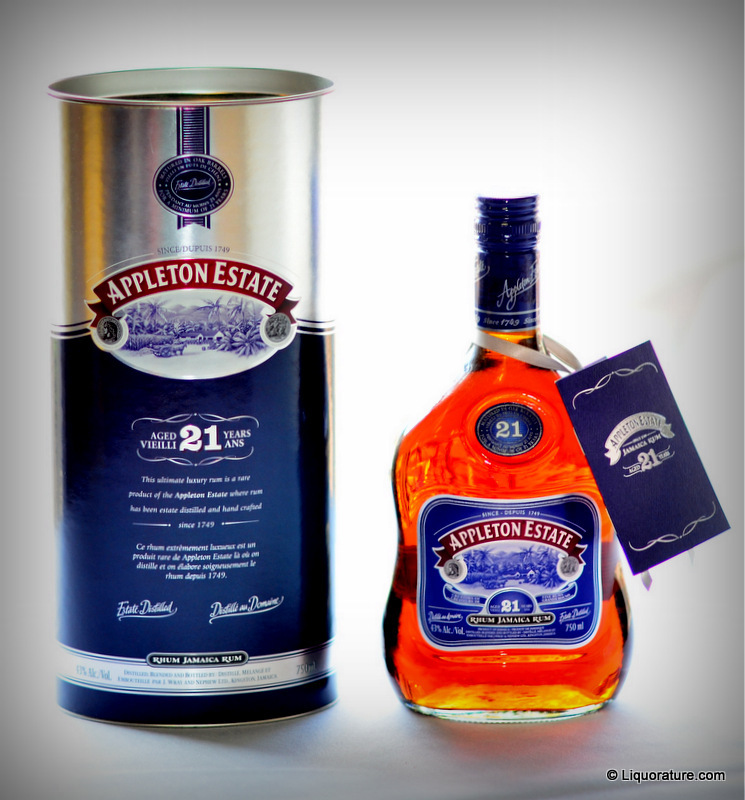 The Appleton Estate 21 year old rum has been around long enough for most reviewers to have had a chance to check it out…in my case, I simply never got around to it, having been less than enthused about the Master Blender’s Legacy, the blend of which it said the 21 forms the backbone. Plus, there are so many other good 21 year old rums out there at a lesser cost (the El Dorado 21 and the Juan Santos 21 to name just two) that I haven’t felt the need to shell out the C$130 for it. Be that as it may, the 21 is the one of the first of the company’s premium rums (the Legacy, 30 and 50 year old are the others, and others will argue the 12 year old should be on the list as well), and deserves notice. Presentation wise it’s nothing special – tin can enclosure, and the same bottle and the same pressed on tin cap as the entry level V/X (a good mixing rum if there ever was one), which always struck me as odd given its supposed cachet as a top flight spirit. The initial not-too-spicy nose of this 43% dark copper-coloured rum were deep and winey, with rich scents of dried fruits that almost, but did not quite descend to the depths of a wine-based spirit. 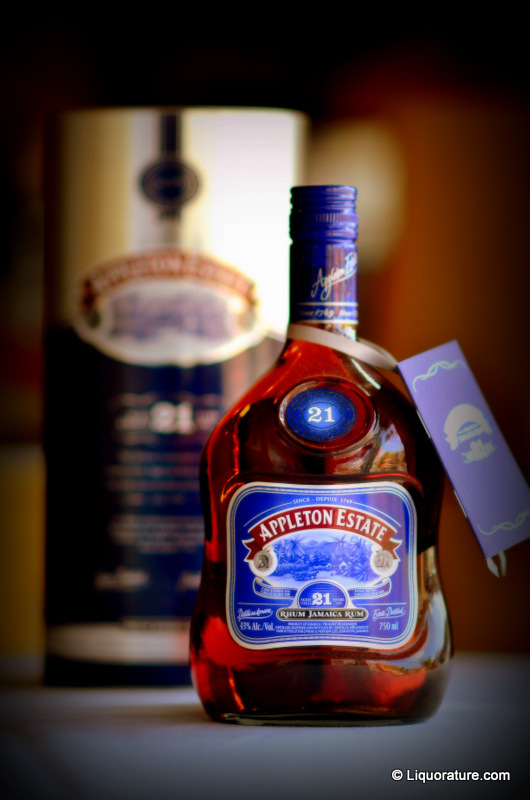 Faint vegetal and herbal notes, with almost none of the signature citrus that are supposedly the hallmark of many of Appleton’s rums. After settling down a bit, the pleasurable aromas of burnt sugar (not caramel) and light flowers made themselves shily known. On the palate, as I have noticed in the past (and here), there was a certain driness in the medium bodied rum, something astringent, mitigated just enough by a heated smoothness that was far from unpleasant, yet transformed the 21 into something more akin to a cognac, also a characteristic of the El Dorado 15, as some have observed (mi padre being one of them). After a while, the sweet began to emerge from hiding in tandem with faint lemon rind and nutty notes (pecan? walnut? ), and upon further opening, the 21 became a bit smoky, the sweet was overpowered, though a subtle whiff of vanilla could be noted coiling around the other tastes. I’d judge it bit better than the Legacy on that score, and the relatively long fade, which was a neat sandwich of orange peel, cinnamon and oak, cemented my opinion. That said, I’m not entirely enamoured of the prevalence of the sharper oak tannins, which held, to me, a somewhat unhealthy dominance over the other, subtler flavours that never quite got their chance in the sun: I sensed they were there, but the defense was too strong. The copper-still-made rum is a blend of molasses-based rums aged a minimum of 21 years in used Jack Daniels barrels, and so are others of similar age, yet with no other comparable product is the drinker fended away from more complex flavours (and bashed over the head quite as insouciantly) as here. Similar concerns over time have led me to downgrade my initially high opinion of the 30 year old. The 21 costs enough and is premium enough, limited enough, for us as drinkers who fork over our cash to expect something more. The thing is, I have a high opinion of Appleton and their products, the company’s longevity and even their rare and pricier bottlings (the 50 is a case in point, though I’ll never buy it) – what is happening more and more often is that I prefer to stick with their lower-tier products and use those as mixing agents for a pleasant late-in-the-week sundowner, rather than incur my wife’s not inconsiderable wrath and buy an overpriced hooch which after the dust has settled, simply does not deliver on its promise.